I am glad that some things never change. (Okay, they may have changed but not very significant). Over the weekend (actually, it is still weekend while I am doing this piece), I went to re-visit a place I have been to 9 years ago. It is a beach in La Union that remains to be relatively unknown to a lot of people. You see, when you say La Union or ELYU, most travelers, tourists, and even locals would storm their way to San Juan (for surfing and beach bumming), San Gabriel for a Tangadan waterfall getaway, or Luna for an artsy day at the Bahay na Bato Art Gallery. So how does one get here? 1. Get off the National Hi-Way in Brgy. Paringao, Bauang, La Union. (This is the most common jump-off point, and the one I have tried on two occasions). 2. Choose any of the many beach resorts lining the area. (eg. Coconut Grove, China Sea Resort, Bali Hai etc.) I have tried China Sea Beach resort way back 2009. And just this weekend, we went to try Coconut Grove Resort. Ask about their boat rental going to White Beach aka Puraw-a-Darat. A small outrigger boat costs around 600-800php for a 2-hour stay at the beach. We haggled and got it for 700php. If you wish to stay there longer, you inform your boatman, but an additional fee needs to be paid. The boats are really small, with which it can only accommodate a maximum of 5 people plus the boatman. I am not just sure if there are bigger ones since all boats I saw were of the same size. They also offer snorkel rental for 100php/ piece. (Which I think is pretty pricey). When we were already approaching the island, our boatman offered the snorkel gears again, but at half the price. (So kelangang lang munang magpababebe sa una para makadiscount pa. hahaha). Going to the cliff and the hidden white sand beach of Poro Point takes about 20-30 mins depending on the waves. I find the experience not for the faint-hearted as the waves can be quite big and nauseating. Once you pass by the famed Thunderbird Resort, and you see a white lighthouse – you are already near. The beach isn’t really a long stretch but is enough for a few group of people. It features some rock formations, pebble and coralline rock sand, and a clear water for swimming and snorkeling. The best part is a short walk up the cliff (which is generally an off-limits area), so one can only stay the edge part. This elevated part gives a really lovely view of the beach. 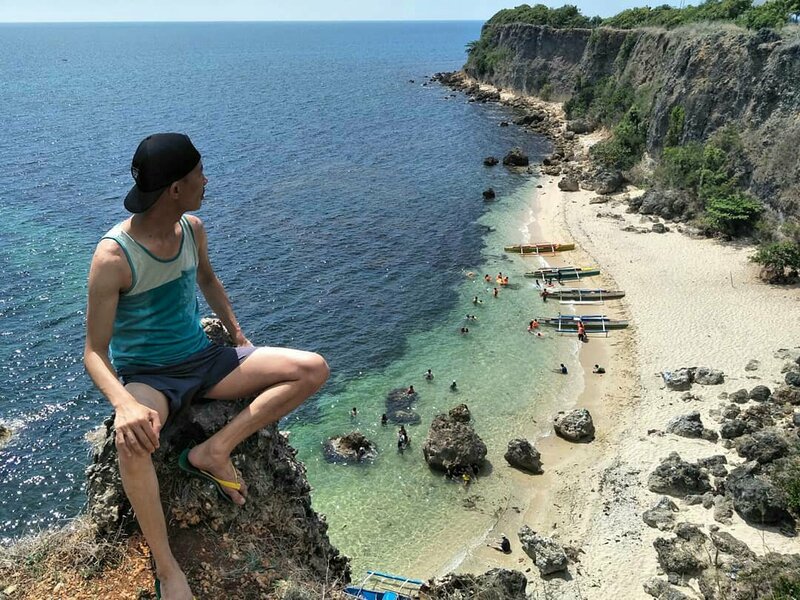 So in summary, the jump off to this place is the town of Bauang but the beach is actually part of Poro Point in San Fernando City. So the next time you want to be in the beach, try to check this place, and you might be surprised that you would find yourself having the entire area to yourself. Don’t be a wasted soul, be JUANderlust. Take it easy! Ang naaalala ko pa din diyan sa Poro Point Thunderbird eh yung mataas nilang bed. Na tipong kelangan kong tumalon para makababa. Hahaha. Wasn’t able to experience the beach back then. Ang sukal kasi. Ang daming branches dahil kakatapos lang ng bagyo. Pero etong beach na ito ay mapupuntahan lamang pag ikaw ay magbabangka. Hahaha. Ah so iba pa yung sa Poro Point Thunderbird ano? Masukal talaga nun. Haha. Maraming dahon sa mga kahoy. Hahaha. HAHAHAHAHAHAHA. Kaya niyo yan! Cheer ko kayo! Hahahahahaha. Every Friday ang poems ko. Kaya nga #PoeticFriday at #FridayPoetry eh. Hahahaha.